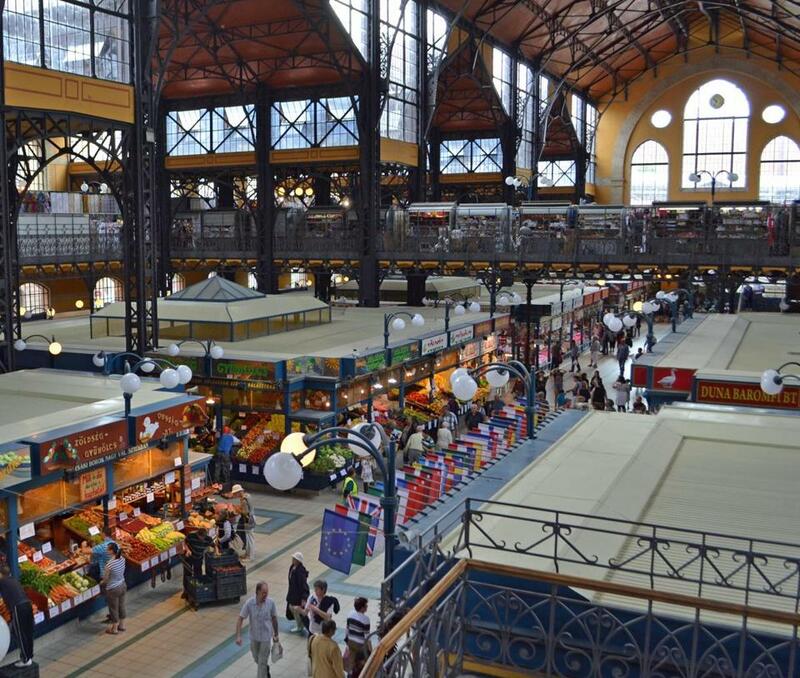 A wide shot of the Central Market Hall in Budapest. We’re on a Taste Hungary walking culinary tour (the cost is $87 for four hours, food and wine tastings, and lunch), where we learn that this beautiful Eastern European city on the Danube River has more to offer than gulyas (goulash). We begin at the market with a shot of the herbal liqueur unicum, made from a secret Zwack family recipe. When the family escaped from Hungary’s communist regime to the United States, they took the unicum recipe with them. While the government tried to duplicate it, according to the locals, it was a sorry substitute for the real thing. Today, unicum is once again made by the original family, in its original Budapest factory. We’re a little lightheaded, and ready for food. We eat the first thing we come across — garlicky langos (fried dough), a popular morning snack. “Hungarians never eat sweet langos,” Szollos tells us. “Those are for the tourists.” Next, we sample pork liver pate wrapped in natural intestines, a spicy pork salami, and a coarse local kolbase, made mostly with horse meat. It is smoky, flecked with paprika, and surprisingly good. 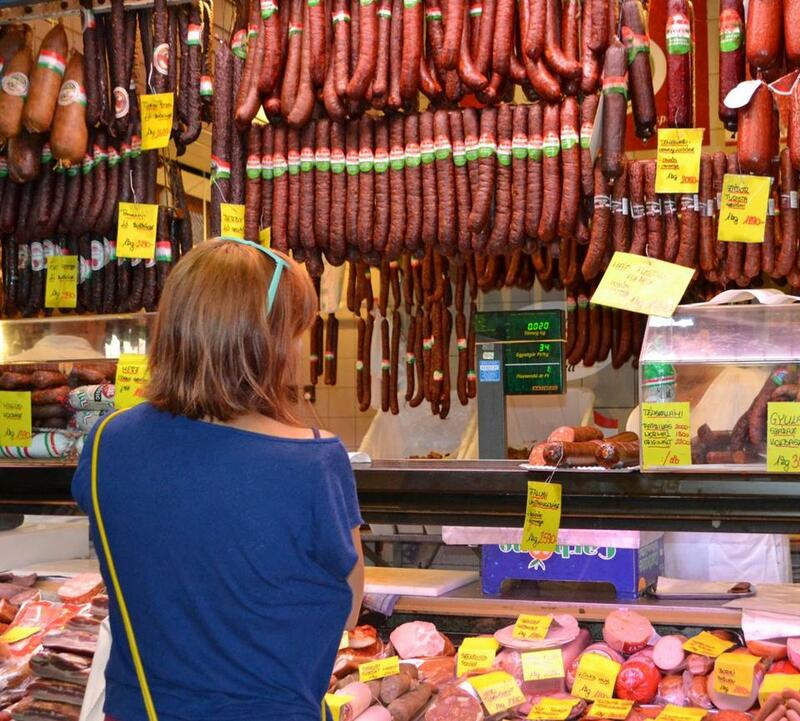 We taste other salami, sausages, and local cheeses, and bites of Turo Rudi, a popular layered chocolate bar. “Turo Rudi is something we got from the Russians when we couldn’t import anything from the West — even ideas,” Szollos says. Hot paprika adds an incredibly appealing warmth to this dish, but you can also use regular sweet paprika. 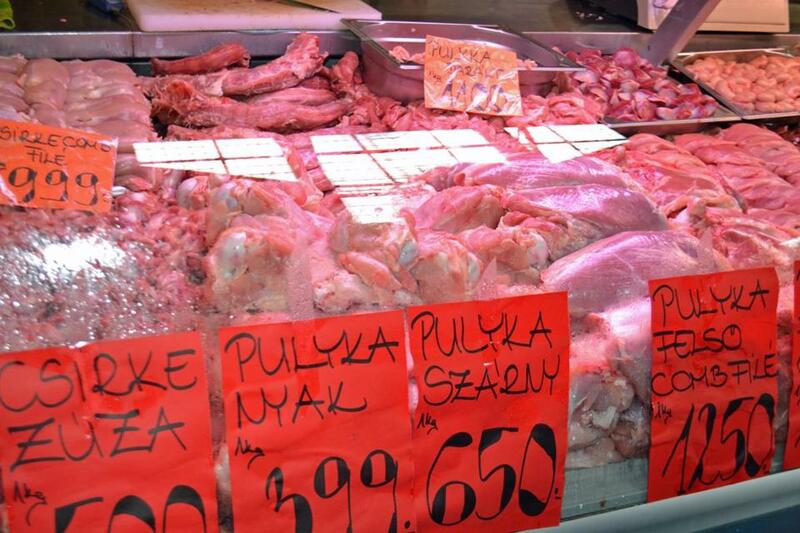 The market is packed with local shoppers buying fresh goose livers, rooster testicles, Hungarian gray cattle, hairy pig’s legs, and foraged mushrooms. In the basement, there are rows of pickled vegetables and counters of fish. We dodge a crowd of shoppers picking out live cod, and move outdoors to the streets and alleyways of Budapest. Our first stop is the Levendula ice cream shop, where we taste scoops of sour cherry, basil-lemon, and lavender-chocolate ice cream. The tiny spot serves up to 80 homemade flavors. A few blocks away, we pop into Rozsavolgyi Csokolade, an award-winning chocolate shop, to sample a sour-cherry and palinka chocolate, and more chocolates seasoned with tarragon. Not bad. We’ve had liqueur, ice cream, and chocolate and it’s not yet lunch. A sausage purveyor at the Central Market Hall in Budapest. Lunch turns out to be an elbow-to-elbow, stand-up affair at a family-owned butcher shop called Belvarosi Disznotoros, loosely translated as Downtown Pig Feast. We dine on sausages, duck leg confit, potato dumplings, steamed cabbage, and pickled baby watermelons. Local meats on display at the Hungarian hall. Afterward, we walk a short distance to Auguszt Cukraszda, the oldest pastry shop in town, founded in 1870. The shop, which was closed down during the communist era, has reopened in its original site, in a beautiful Neo-Renaissance building. We eat slices of rich, seven-layer Dobos cake and a flourless Esterhazy torte, both traditional Hungarian pastries. But a beautiful and modern French torte with apples and passion fruit is also irresistible and we try that too. “This is a really nice place to enjoy a glass of wine,” Szollos says, as we follow her through Karolyi-kert, a pretty park lined with outdoor cafes and small wine bars. “I just discovered this place yesterday,” she tells us. It’s located on a narrow side street, and has two small outdoor tables. The owner greets us and recommends a sampling of wines from regions across Hungary. We try a sparkler from the Pannonhalmi Salve winery, a smooth, mineral-rich white wine from the Nagy-Somloi hillside, and a slightly spicy Kekfrankos red from the Szekszard region. By now, the midday sun is reflecting off the river and casting shadows against the Buda Castle. We decide a long walk along the Danube Promenade is a great way to end the day. 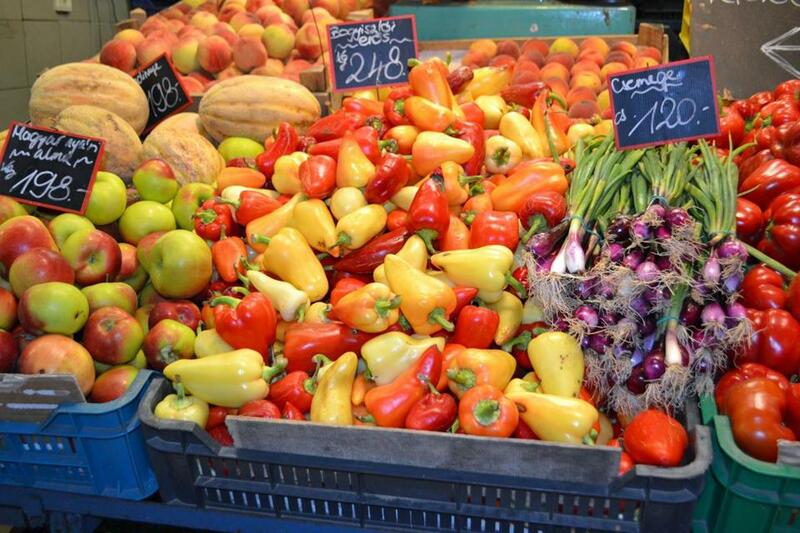 Fruits and vegetables are on display at the Great Market Hall in Budapest, Hungary.